CJCA will be hosting their second annual KEIROKAI at the Nikkei Centre on Saturday, January 28, 2017. 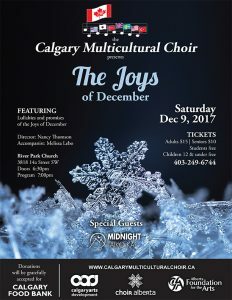 Midnight Taiko Kai will be collaborating with the Calgary Multicultural Orchestra to perform a combined piece to showcase the multiculturalism and musical talents in Calgary. To attend the awards gala, you can purchase tickets on the IDA 2017 Gala website. 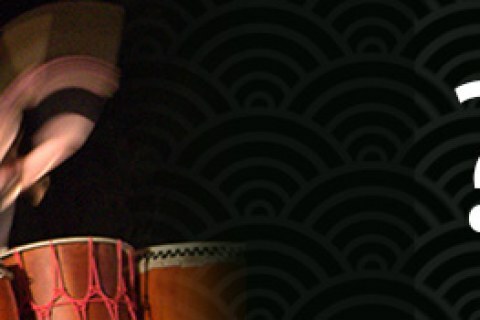 Midnight Taiko will be joining the Taiko class at the MRU for their spring recital. Come and see the new students perform their pieces, as well as some other songs by members of Midnight Taiko. Admission is free and the event is open to the public, so come and enjoy some Taiko drumming performances! 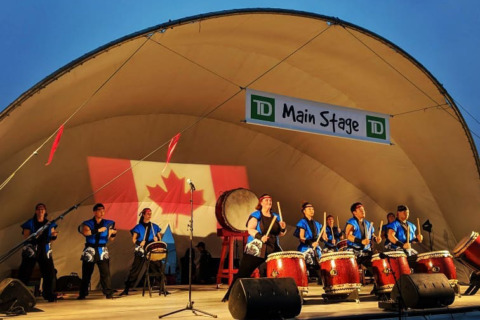 Midnight Taiko willing be helping to kick off Asian Heritage Month for the month of May with support from the Asian Heritage Foundation - Calgary. We will be performing in lobby of the Jack Singer Concert Hall at the Arts Commons along with many other cultural performances. Visit the Asian Heritage Foundation's website for more details: http://asianheritagecalgary.ca/. Midnight Taiko Kai will be performing for the City of Calgary on Canada Day to celebrate Canada's 150th birthday! We will be performing a 30-minute performance on the Riverfront Multicultural Stage along Riverfront Avenue SE, behind the Harry Hays building. There will be lots of other events and activities happening throughout the city but make sure to come by Riverfont Avenue to watch us perform. There will also be food trucks! Midnight Taiko Kai will be performing in the Town of Banff on Canada Day to celebrate Canada's 150th birthday! We will be performing two sets at 7:45pm & 8:30pm (subject to change) at the Central Park. There will be other musical performances and lots of family activities throughout the day, including a Canada Day Parade in the afternoon starting at 1:30pm, so make sure to come by and enjoy a day in the mountains. The Calgary Japanese Community Association in collaboration with the Calgary Yosakoi Soran Team and Midnight Taiko will be representing the Calgary Japanese community with a parade entry in the 2017 Calgary Stampede Parade! The push-cart design is the same as a traditional Japanese matsuri cart and will house our 35" Hira daiko on the back. Along with the cart will be dancers and Taiko drummers performing several traditional Japanese songs. Midnight Taiko will be performing for the opening ceremonies of the Alberta Special Olympics held in Medicine Hat for 2017. There will be over 900 athletes in attendance and the event will be covered by sportsnet.ca as well as Shaw Cable. The opening ceremonies is free and open to the public. In today’s increasingly polarized and opinion-driven world, where willful ignorance and deliberate anti-intellectual campaigns appear to be on the rise within society, what is Signal and what is Noise? Whose ideas are worth listening to (and amplified), and whose distractions and untruths should be tuned out? For 2017, TEDxCalgary is bringing together an incredible group of speakers to challenge our assumptions about the world around us, spark our imaginations about the potential future in front of us, and help give us the perspectives to navigate a journey that demands even more profound wisdom from human beings, individual acts of courage to change, and a shared collective vision for tomorrow. It all comes together on November 4th in a crescendo of experiences, ideas and dialogue. Our more than one dozen speakers and performers are dreamers and doers, technologists and entrepreneurs, business leaders and creators. All will be bold and provocative in their perspectives, at a time when humanity most needs innovative ideas that can be nurtured and amplified to meet the volatile, uncertain, complex and adaptive challenges that surround us.